Skype has been targeted by cyber criminals again this week. Users are receiving a new Spam Email with subject “You received a new message from the Skype voice mail service.”, that actually leads to Zeus Malware. Zeus is a Trojan horse that attempts to steal confidential information from the compromised computer. It specifically targets system information, online credentials, and banking details, but can be customized through the toolkit to gather any sort of information. 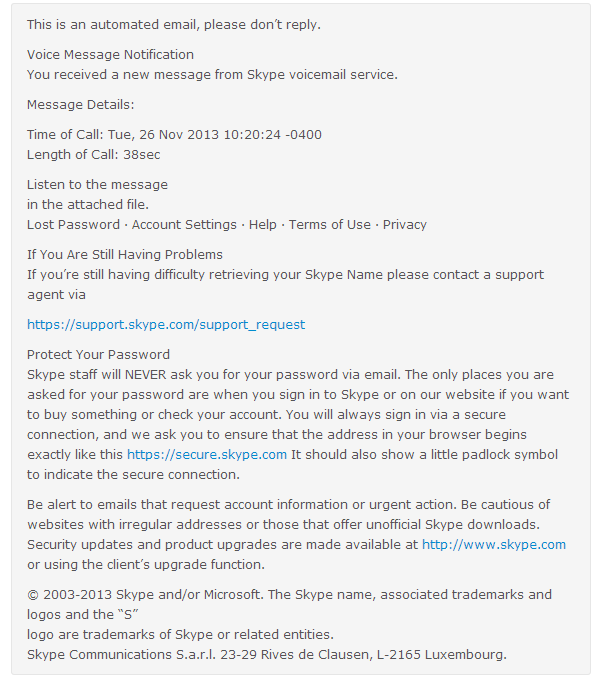 The email is sent from the spoofed address “Skype Communications” and seems to be genuine, it has similar body content and the official Skype logo that usually comes with a legitimate Skype voice mail alerts. “This is an automated email, please don’t reply. Voice Message Notification. You received a new message from the Skype voice mail service.” the email reads. The fraudsters have also tried to make the emails look genuine by adding real links back to the Skype website. If you receive one of these emails, delete it and don’t download.